Back-Lapping is performed to change the mechanical, electrial or optical properties of the material. Centerline Technologies utilizes the DFBL 200 Dragon Fire Back Lap production tool with vacuum hold down, precision fixtures, and temperature controls that safely enable thickness reduction of fully populated 6” high-value-micro-electronic and micro-optic wafers to a total thickness variation below .001”. Back lapping is the process of thinning wafers by removing material from the rear of an object, ie., the unpolished face. This is performed to change the mechanical, electrical or optical properties of the material. Consideration of the residual strength of the material after back lapping must be evaluated in order to determine the proper mounting method. The choice is a permanent bond, or a temporary bond. This choice depends on the future usage of the material. The final decision will be the accuracy required in the final thickness and thickness variation. 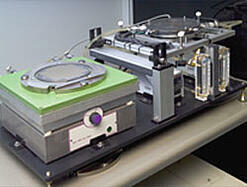 Centerline Technologies is capable of back lapping wafers from 150mm dia. to die level at 7mm square. Thicknesses available will depend on size of substrate and type of material being processed.